1967 was a quiet year for the band but Butterfield did cut an EP with John Mayall that was released in the U.K. by Decca. When Butterfield returned with Resurrection Of Pigboy Crabshaw in February 1968 (Pigboy Crabshaw was Bishop's nickname) it was with a fresh rhythm section and a three piece horn section. Climbing to No. 52 in the Billboard charts this was to be Butterfield's most successful album. Although it followed the usual blues format, it had a distinct soul influence. Compositions included Booker T's Born Under A Bad Sign which Albert King had made famous, and One More Heartache, a Smokey Robinson song which had been a hit for Marvin Gaye. 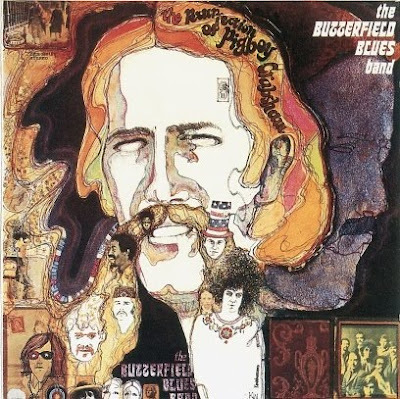 However, many of Butterfield's fans and some critics yearned for high-powered, white electric blues and regretted the band's latest soulful direction. When In My Own Dream emerged later in 1968 it was also slated in some sections of the music press. The line-up was basically the same as for the previous album, although producer John Court joined forces with Buggy Maugh, Charles Dinwiddie and Phil Wilson to provide vocal harmonies as The Icebag Four and Al Kooper guested on organ on a couple of tracks (Drunk Again and Just To Be With You). The album was musically diverse ranging from bar-room blues, to folk blues and electric music, and was criticised as being too fragmented. However, if much of it was uneven, the title track was distinctly innovative with the Icebag Four's backing vocals lending a gospel feel to the song. It reached No. 79 in the U.S. album charts. Elvin Bishop left in 1968 to form his own band and was replaced by Buzzy Feiton for Keep On Moving, a heavy album with lots of brass, which could only reach No. 102 in the U.S. album charts. The band appeared at the Woodstock festival in 1969 and one of their songs, Love March was included on the original Woodstock album. Live recorded with a new line-up live at L.A.'s Troubadour club in 1970, and produced by Todd Rundgren, saw some upturn in their fortunes (albeit temporary) reaching No. 72. It contained a selection of material from their three previous albums, Everything's Going To Be Alright (also featured on the Woodstock 2 LP) and three tracks which do not appear on other Butterfield albums:- The Boxer, Number 9 and Get Together Again. By now Butterfield was tired of touring and he broke up the band in 1971 after a final studio album Sometimes I Feel Like Smilin', which could only manage the 124 spot in the album charts. Golden Butter Live Double, a double retrospective compilation, peaked to No. 136 the following year. 1972 also saw the release of An Offer You Can't Refuse which featured his earliest recordings back in 1963 with Smokey Smothers' band in Chicago, by specialist U.K. blues label Red Lightnin'. They account for one side of the album. The other side features Walter Horton, backed by musicians like Buddy Guy. This album was reissued again in 1982. More recent still is the Edsel 1985 release which is now the most accessible guide to the music of the Butterfield Blues Band. 1995 also saw the release on CD of The Original Lost Elektra Sessions (Rhino RZ 73505), which compiled material from an abandoned 1965 first album, which is largely dominated by powerful blues covers. It contains 19 tracks in all. Bugsy Maugh later recorded two interesting albums for Dot. Paul Butterfield died in the nineties. If you're into high powered white electric blues these guys are essential for you, but if you're garage-punkers or into demented psychedelia give them a miss.